← Thinking of Starting Sewing Classes in Brighton this Autumn? Another New Teacher Joins the MIY Workshop Team! Meet Richard Clark-Monks better known as Ricky! I’m so happy that he’s joining my teaching team. Ricky will be teaching the Wednesday evening and Thursday morning classes from next week. Ricky’s sewing journey began in the mid 90s starting in adult education classes at Kensington and Chelsea college and he was soon cutting his own patterns and sending outfits down the catwalk at the end of year show. After the unimaginable luxury of studying with a sewing teacher who was trained in Paris in the 40s he went on to do a Fashion BA at Middlesex Uni and graduated in 2002 with a BA Hons 2/1. Since graduating he’s made wedding dresses, made the pattern and finished garment for a TV commercial, cut a waistcoat for Fallow Denim and worked on several private commissions. Ricky has been teaching since 2012 and continues to feed his passion for the art of pattern cutting; always looking for interesting pattern cutting solutions and collecting books on the subject. He’s also sings in a choir and bakes like a demon, but don’t expect that in your sewing class!! 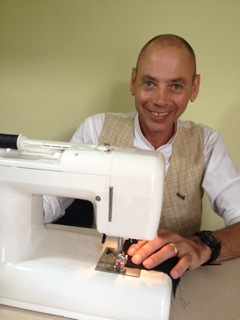 If you’d like to meet Ricky, he’s going to be doing a talk at the Dressmaker’s Social on Monday 21st September all about sewing menswear. I love the posters Emma designs for these events, here’s Ricky in all his glory! Find out more about this event and previous socials here. 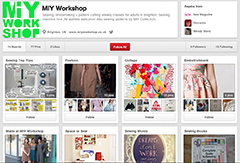 This entry was posted in MIY Workshop, Weekly classes and tagged dressmakers social, learn to sew brighton, MIY Workshop, richard clark-monks, sewing classes Brighton, sewing teachers. Bookmark the permalink.